A couple of days ago, my Dad told me that many visitors find my site by searching for beaches.com. I was surprised by this... after all, I had never mentioned that site on this one, never even visited it. Anyway, my Dad went on to explain that beaches.com was a commercial site where you could find all-inclusive vacation package trips to the Caribbean.So I decided to check it out and see what they offered for Anguilla (or "anguila," too!). Whoops! The site is neat and slick, but it's not about the Caribbean that we know and love. 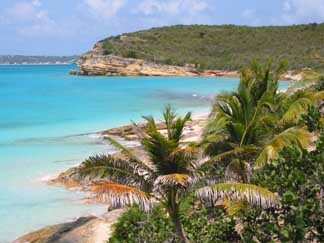 Anguilla is the ideal-idyllic Caribbean island. Nothing comes close. Here are a few examples of why you'll never see Anguilla packaged into beaches.com. There are a couple of places to check-in, one customs agent, one security check, one American Eagle Turbo Jet, one short runway, one small (but decent) restaurant, and all this on one level. Arriving and departing couldn't be easier, friendlier or more low-key! 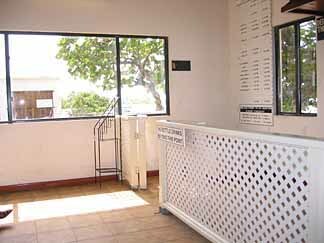 There's simply two decks, one waiting room, one check-in, and boats that are run by the actual owners! It's so fun to get the ocean spray when you're riding up top some of them! On the ride back, my Dad and I got soaked, even ruined a camera -- but it was worth the fun! Next reason why Anguilla isn't beaches.com? You're on your own! This is not Club Med! Yes, there are a couple of tour guides... Bennie Conners is a fun, funny, and pleasant guy and will shuttle you around in great style. But my Dad loves to take his high-detailed Land and Survey map, get us all in the car, and try to kill us by driving off cliffs (or so it seems sometimes)! Much of the "old Caribbean" architecture still remains, even though more and more of the new construction is made of hurricane-proof cement. 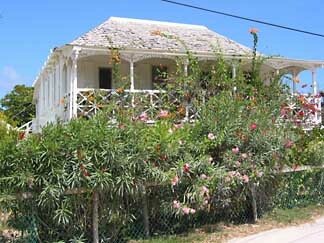 But you'll still see beautiful Caribbean architecture, charming churches, even archaelogical digs! Yes, it's an island truly worth exploring from end to end. And, of course, another big plus about adventuring on Anguilla is that it's so safe. Other islands tend to have a higher crime rate due to much poverty. Anguilla has one of the lowest crime rates in the world. After all, it's pretty hard to hide out on a speck of sand! 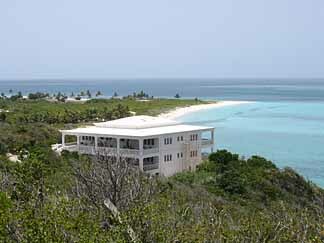 One more "no beaches.com on Anguilla, please"... no high-rise hotels! There are simply no huge, beach-blotting rows of high-rise hotels. Sure there are several sensational hotels/resorts on Anguilla. However they are not all on the same beach. On some of the larger beaches, there may be two or three, nicely spread out. And they are all low-rise, and elegantly sophisticated. This leads me to my last, most important reason why you'll not find an "Anguilla package" in beaches.com. Anguilla is "the Caribbean." Perfect beaches with soft white powdery sand, crystal clear water, a big warm sun and warmer people... and the crowds are all over at beaches.com! At most, you'll find a few people on your beach. 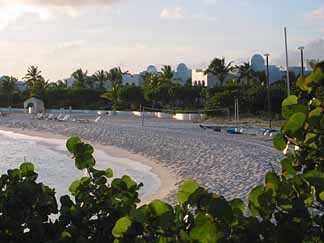 But you will never feel crowded or have trouble finding your perfect spot to lounge like a lizard and relax in the sun! All in all, Anguilla is the Caribbean island that you dream about. No Toto, it's not Kansas... nor is it beaches.com.